Gratitude Marina has proudly provided the best access and views on the Chesapeake Bay for over 50 years. 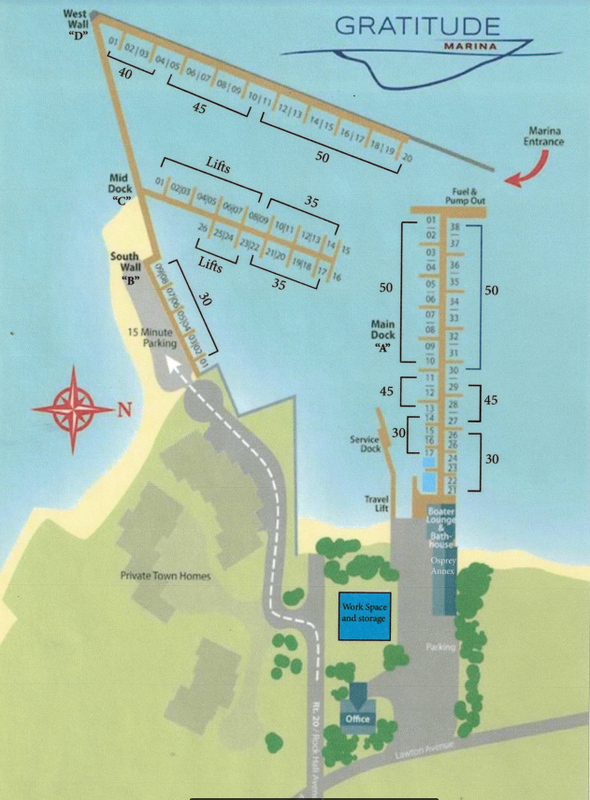 Conveniently located in Rock Hall, MD, we are a full-service marina with lift slips and a wide access channel. We offer full-length finger piers equipped with electric and water hookups. Give us a call today and make Gratitude Marina your new permanent home! 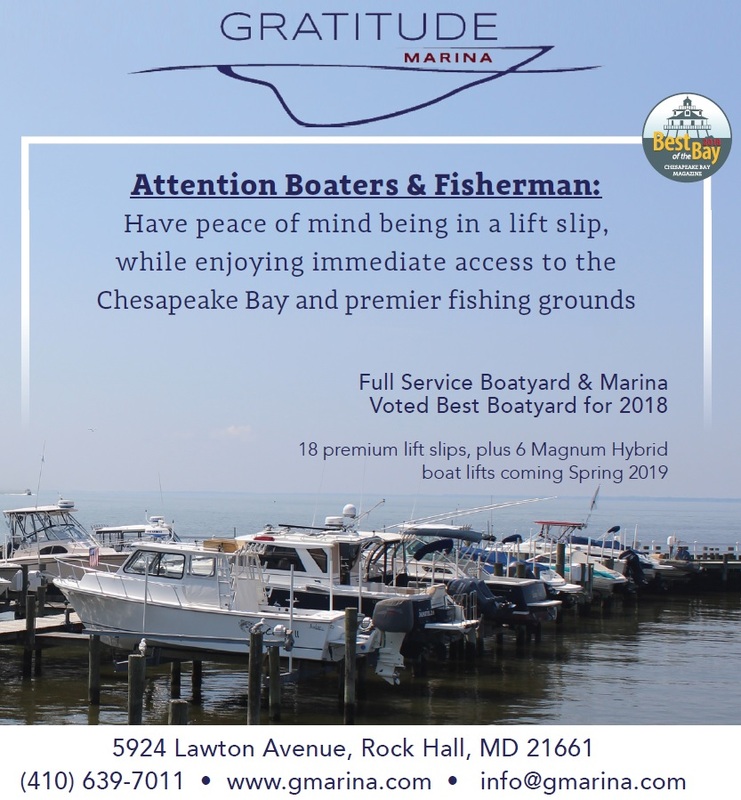 One of Gratitude’s greatest amenities is our full-service boatyard, which was voted Best Boatyard in Chesapeake Magazine’s “Best of the Bay 2018”. Because we understand how expensive boating can be, we offer more than competitive service rates and can handle all of your painting, fiberglass, gel-coat, rigging, and mechanical needs. Led by our service manager, Wade Hague, our service department prides itself on getting the job done right and on time, the first time. We take care of your boat as we would our own. Gratitude is proud to announce the new addition of Benji Wachowiz as our Head Mechanic. He is known around the Chesapeake Bay as an outstanding marine mechanic. He has been certified in John Deere, CAT, Cummins, Detroit, and the list goes on. If you need engine work done on your boat, we have the man for the job. If you are looking for a new home port, a weekend getaway, or a fresh place to store for the winter, Gratitude offers seasonal, monthly, and transient slips, as well as, dry storage. This season, we have a bundled slip and winter storage deal allowing you to save even more! Sign up for a one year deal (slip & winter storage) and receive $250 off your slip and a discounted winter storage rate. In addition to these savings, NEW slip-holders receive FREE winter storage for the winter season. Gratitude Marina is a sister marina to Osprey Point. This relationship entitles all slip-holders to receive a 15% discount on rooms at the Osprey Point Inn, including the Annex, located right on the Bay at Gratitude. Gratitude slip-holders also have access to all Osprey Point amenities (restaurant, pool, bikes, etc.). Besides service and slips, Gratitude also has one of the easiest access fuel docks the Chesapeake offers, with competitive fuel prices, and the most generous fuel rewards program on the Bay. The Osprey Point/Gratitude Fuel Club Rewards offers 10¢ off per gallon to all its members.